It’s the same old story each and every autumn: the air turns crisp, leaves drop, days shorten and pumpkin spice lattes and apple orchard adventures overtake my Instagram feed. As soon as the annual chill arrives, without fail, my practically Pavlovian-style response is to run out (or hop online) and spruce up my wardrobe. And now that I’ve completed a fall closet clean-out, giving my unwanted goods to Savers, there’s actually a wee bit of room to squeeze in some new goods! To keep me focused as I browse the thrift-store racks, I honed in on the pieces I was missing (so easy to do after a thorough closet clean-out) and inspiration, both old and new, I can’t get out of my brain. By refining my thoughts and making a list, I’ll save time when thrifting big stores like Savers and money I may have accidentally spent on items I don’t need. Below are the essentials that made the cut! Dark florals: I feel more than a small twinge of sadness when it comes time to pack up my favorite summer florals. Fortunately, thrift-store racks boast plenty of saturated prints and I plan on sussing out at least a dress, blouse, skirt or scarf before the snow flies. Jeans to destroy: “Oh hell no!” = my instant reaction to the prices I’ve seen on tattered denim ($148 for the pair of jeans pictured above, OMG!). I figure if I thrift a few pairs that fit well and screw one up in the distressing process, no bigs, I’ll still be about $130 ahead. Black denim jacket: Seeing as I wear my denim jacket four out of seven days a week, seeking out a black one seems kind of like a no-brainer. To me, a good denim jacket fits like I borrowed it from my boyfriend, so I’ll definitely be combing the men’s section at the thrifts for this. Midi skirts: My love of midis will not wane, so what? But truly though, what’s not to appreciate. They’re an acceptable length to wear to work, warm and, perhaps best of all, super easy to thrift. For fall, I look for wool or wool blend midis, and maybe a poly option or two. Turtleneck sweater: Ever since elementary school, turtlenecks and I have kept our distance, but I’m feeling like this year is THE year to get over my aversion. 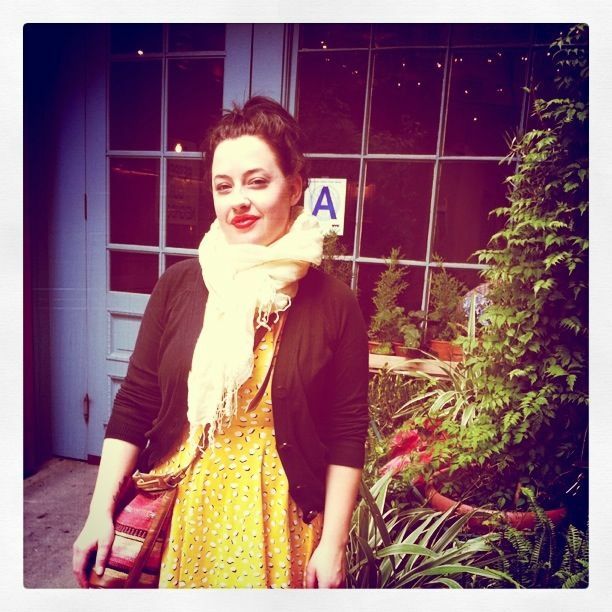 If I can find one that’s a fun color, like the nubby Orla Kiely beauty pictured above, I’ll be in cozy town in no time. 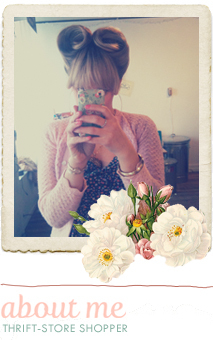 Vests: This summer I wore two denim vests so much, it made me realize how more belong in my closet. I love how they can introduce another texture to an outfit, plus, they’re warm! 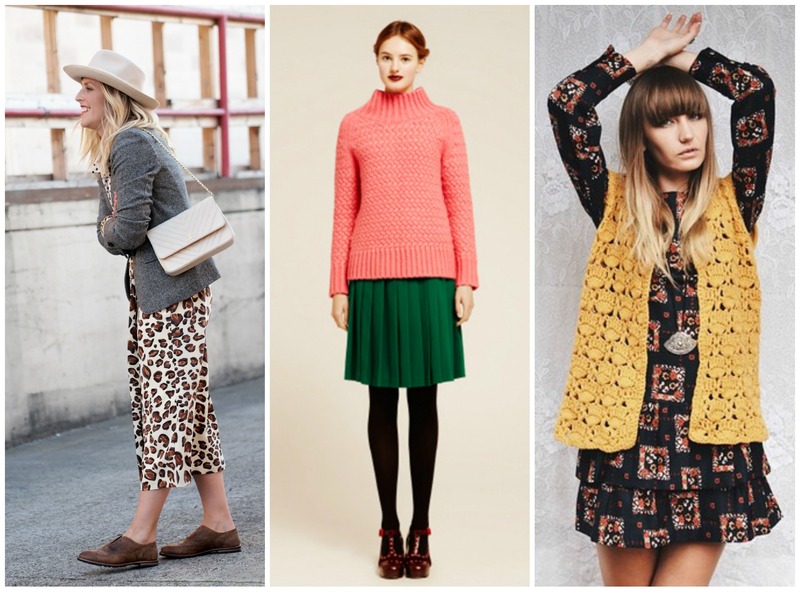 From suede to crochet, fur to wool, I know I’ll have lots of luck finding some solid options secondhand. A bold coat: Green, black, green, black, navy. That’s my coat collection in a nutshell. This fall, I’m on the hunt for something bright and something bold. Mustard, emerald, red, baby blue, oxblood, pink…as long as it’s not black, green or navy, I’m game! A simple shift: Solids are out of my comfort zone, but the big-haired beauty above has given me hope that I can wear a non-printed dress and not feel totally drab. 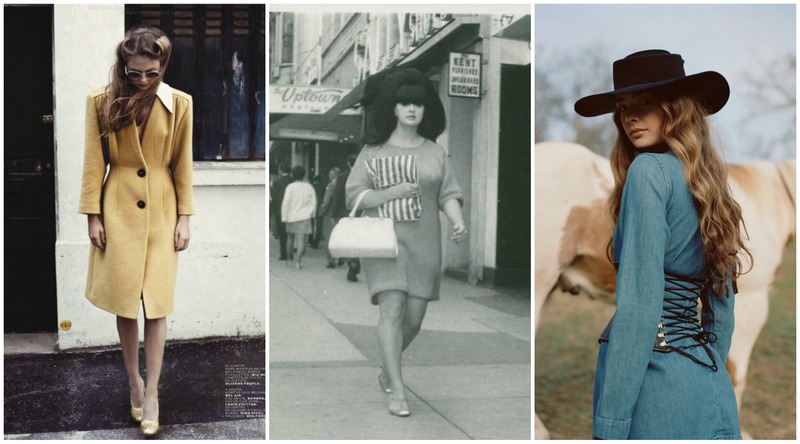 If I follow in her footsteps, pairing it with some huge hair and a killer bag, this staple just might work! 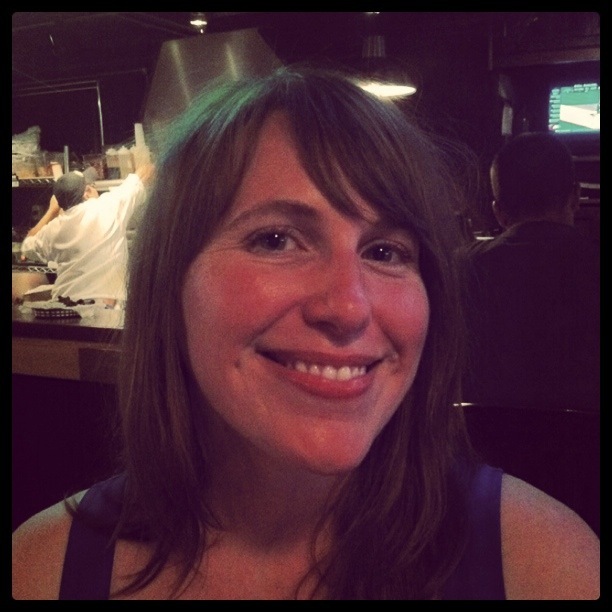 A wide-brimmed hat: Turns out, I’m kind of picky about hats! Disappointed by the quality of the ones I’ve found at the mall, and reluctant to shell out for one, I’m going to keep my eyes peeled at the thrifts, shopping both the men’s and women’s departments ’til I find the perfect one. 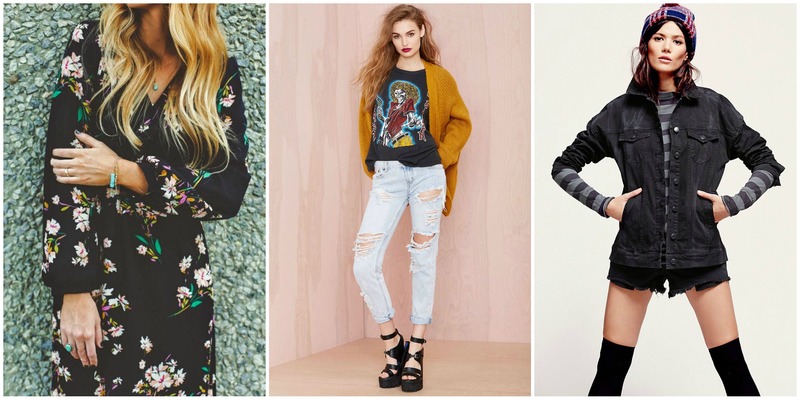 Are you hot on the trail of particular items this fall? Does making a checklist help keep you focused? If you’ve got any fall shopping routines or tips, I’d love to hear ’em! P.S. My friends at Savers sponsored this post; all opinions are my own. Do you ever come across a fabric or material at the thrift-store and think “What the heck is this?” I sure do. So, in an attempt to get a bit more educated about the vintage I buy (and resell), I thought I’d start up an irregular series that defines and illustrates materials I often see (and wonder about) at the thrifts. 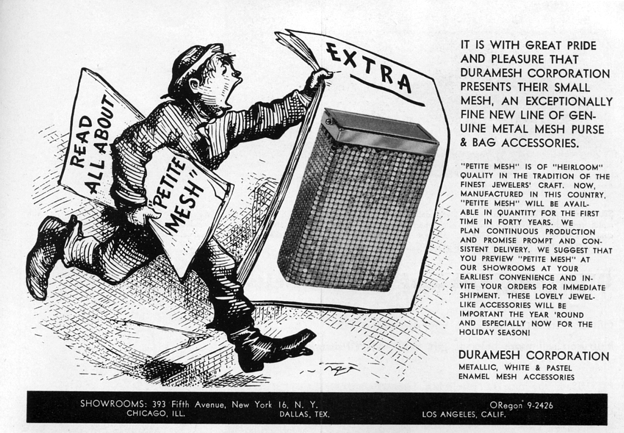 Today, let’s talk about metal mesh, also known as duramesh! 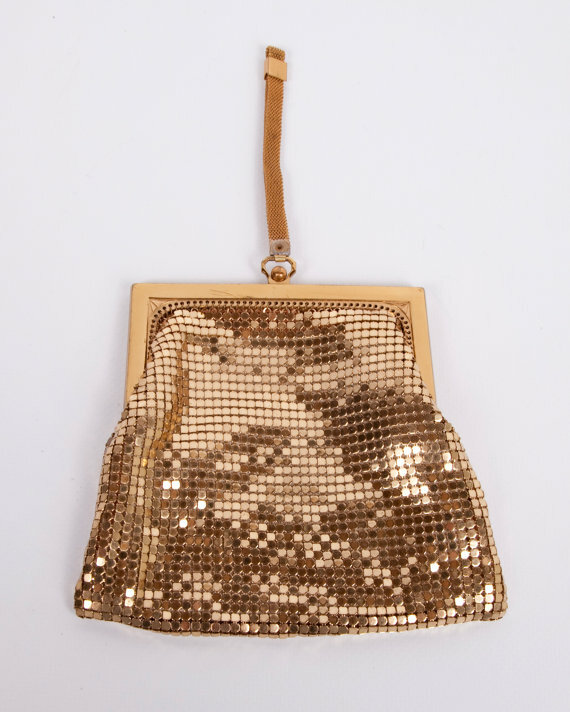 Although mesh handbags have been around for ages, it wasn’t until 1909, when A.C. Pratt of Newark, New Jersey invented the mesh-making machine, that these slinky accessories became widely available. 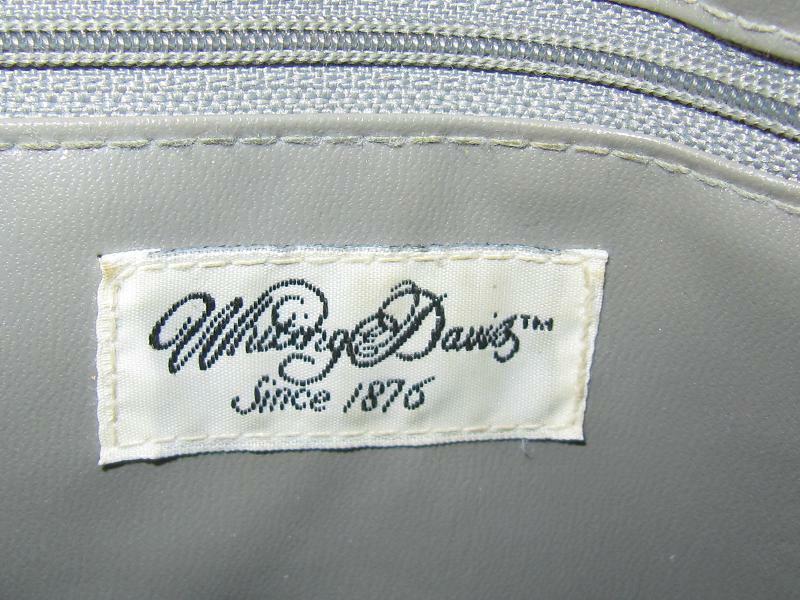 When you’re out and about thrifting, look for these three brands: Whiting & Davis, Mandalian Manufacturing and Duramesh. Some Mandalian bags, like the one below, also bear the Lustro-Pearl mark, so keep an eye out for that name too. 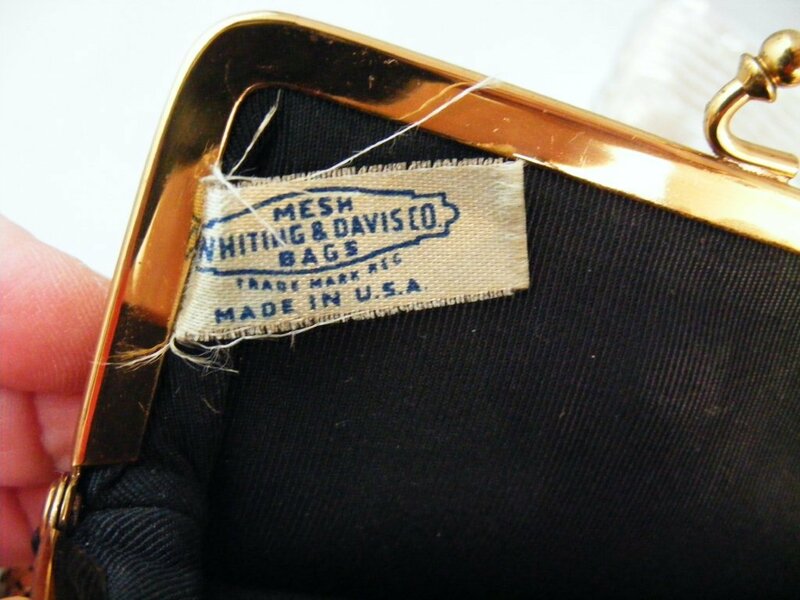 After WWII, Duramesh became a major competitor to Whiting & Davis in the mesh purse game. 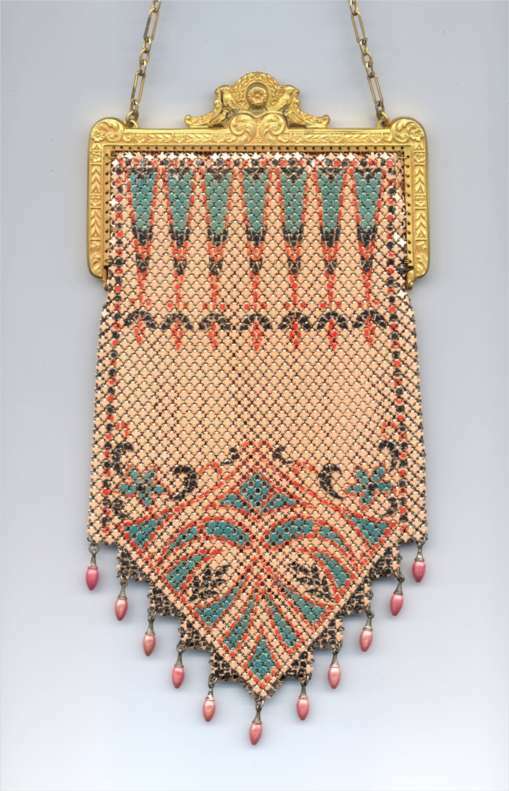 Duramesh focused less on the artwork applied to outside of the bag (popularized in the ’30s), and more on shape and style of the purse itself. Here’s an ad for the brand that ran in the October 1955 issue of Handbag & Accessories, a trade magazine for buyers, inviting them to visit Duramesh showrooms in Chicago, Dallas and L.A.
Other items to look out for include brooches, scarves, bibs and makeup bags. ♥ When thrifting duramesh bags and accessories, check the links over carefully to see that they are all connected and secure. The texture should be smooth—nothing should be poking out or catching. ♥ Denting is common in duramesh purses. Hold the bag at an arm’s length and check the exterior. 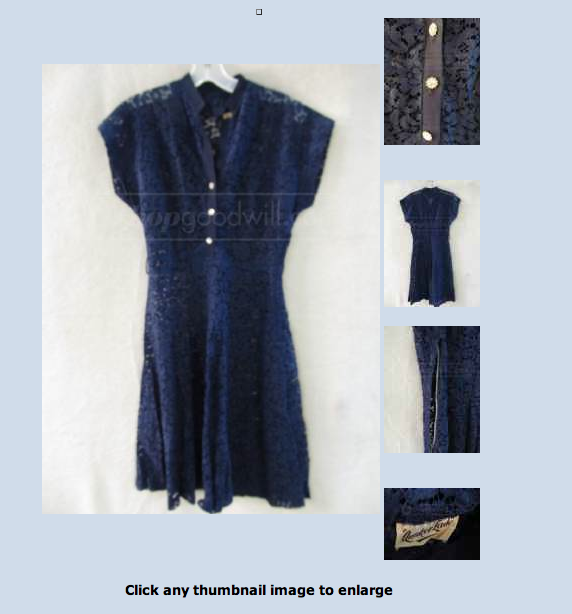 ♥ Examine the lining, making sure it is free from holes and discoloration. If you’re looking at jewelry, make sure the clasp is in good shape. ♥ Read the label/product details! 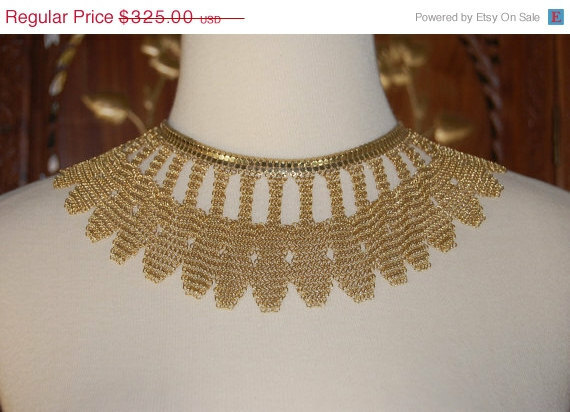 Lots of Etsy sellers tag items “Duramesh” when it’s really not. (Take this halter top for example.) 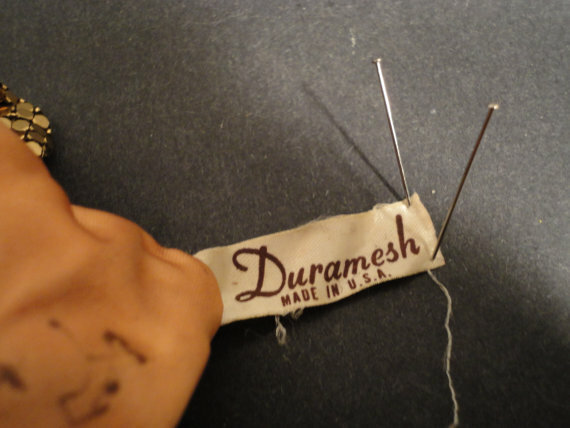 If you’re looking for vintage duramesh, you need to check the label! ♥ To get a feel for judging the era, rarity and resale value of duramesh pieces and styles, window shop online. A quick search for Whiting & Davis on Etsy turns up thousands of goodies to sort through! Since duramesh bags and products have been mass-produced since the early 20th century, it might take a while to get the hang of knowing what’s vintage and what’s not…don’t stress, that’s part of the fun! ♥ Once you’ve found a piece you love, avoid contacting it with sharp or abrasive surfaces that might pull, poke or dent the mesh. ♥ Avoid exposing duramesh to hairspray, perfume or alcohol, too. If you do spill your drink on your bag (been there, done that! ), wipe it up promptly with a soft cloth. ♥ Buff your bag occasionally with a clean, soft cloth to remove dirt and restore it to its original dazzle. Use a light hand; elbow grease isn’t required when cleaning this delicate material! Now that we’ve tackled duramesh, I’d love to hear from you. Is there a fabric or material you wonder about when you’re at the thrift store? If so, please drop me a line! I’m terrible at a lot of things. Getting my dry cleaning out of my house and to the cleaners being one of them. 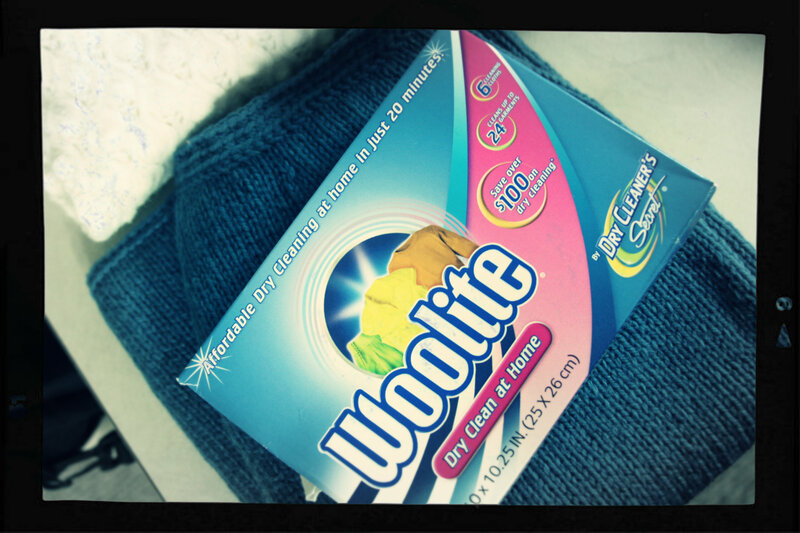 Fortunately, I was recently introduced to a fabulous Woolite product, “Dry Cleaner’s Secret.” Unlike Dryel, which I’ve had so-so luck with and requires you to use an annoying bag, Dry Cleaner’s Secret is basically a wet dryer sheet with stink-busting super powers. Toss one into the the dryer along with one to five dry-clean only garments, and 20 minutes later you’re set to go. Funky thrift-store smells = totally gone! Clothes with stains and specialty items like leathers, velvets, suedes and furs will still need to go to the cleaners, but for things that just need a simple quick freshening, this is my new jam. Deal-seekers can get a free sample of the stuff by filling out this form (and attaching a recent dry-cleaning receipt), printing out a coupon for it here or you could be like me, and mooch a couple packets off your mom. (Thanks Mom!) In Minnesota, it’s available at Wal-Mart, Cub Foods, Menards and K Mart…you can find locations in your area here. Hitting up the super sale days at thrift stores comes at a price. The odds that the stores will be overrun with fellow bargain hunters are great, and without proper preparation, you might go a little bonkers. (Goodness knows I sometimes do, and I thrift all the freakin’ time.) So, if you’re planning on hitting up any of the 4th of July sales this weekend (here’s my round-up), here are some awesome tips from experienced friends of mine you might helpful. 1. Bring beverages! I start my morning with plenty of coffee and bring along a water bottle. Hydration is important. 3. If you can avoid a cart, do it. Trying to maneuver your cart through crazy people, stray children and thrift-store employees can be a drag. 4. Focus! This may not be the best day to peruse every section… stick to what you are really looking for and bee line for that area of the store first. 1. Know what you are getting yourself into. Think Black Friday openers for the newest toy fad plus people who are even more into deals than the average shopper. This makes for an intense bunch of rabid treasure hunters. As I see it, you have two choices—to embrace the crazy and become one yourself OR attempt to float above it all, untouched by the seething anger that tends to erupt when you find yourself fighting over a treasure with another, less enlightened shopper. If you take the latter route, do some meditation in your car before entering the store. 2. Watch out for small children. Despite store’s best intentions with their loudspeaker reminders that your children must be by you at all times, mega sales at thrift stores tend to be crawling with unattended children. You will feel really bad if you accidentally hit one with your cart, even if it is their fault. 3. Keep an eye out for potential competitors. Thrifting brings together people from all walks of life. 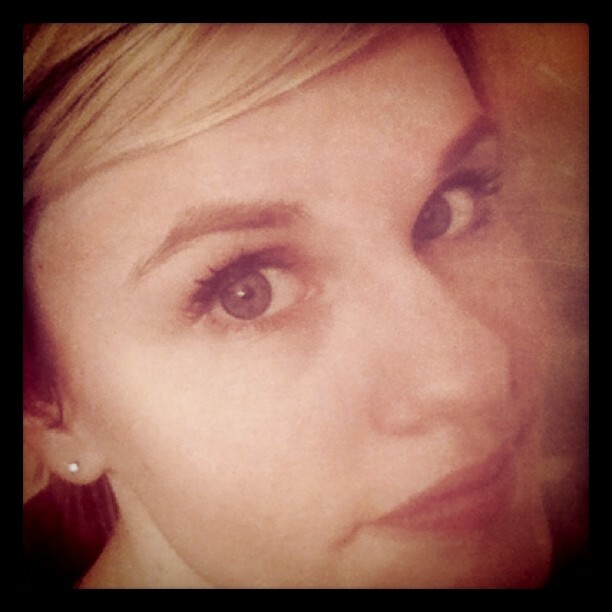 Upon entering the store, and during your shopping time, look for people who look like they have similar tastes as you. Hit the sections they aren’t in, before they can get to them Note: this sort of action is fitting if you are taking the “embrace the crazy” mindset described in tip. No. 1. 4. Don’t allow yourself to be blinded by deals. Mega deals tend to warp the brain, causing thrifting judgment to go out the window—when deciding on your final items, resist the tendency to buy whatever you have gotten your paws on and ask yourself if you really, truly want/can’t live without the item in question. 5. Have patience. If you hit up a sale later in the day, chances are items will be rather picked over. The plus side to this is that you can shop in a less intense environment. No matter what, don’t give up—I once unknowningly stumbled upon a 50% off sale at Value Village to be sorely disappointed, that is, until I found one of the most amazing/strangest pieces I have found thrifting—a business casual drunk Mickey Mouse short-sleeved sweatshirt style t-shirt. Had I given up after the first twenty minutes, I would have never found this gem. 1. Be kind to your fellow thrifters. It can get pretty nutso in there and sometimes the worst of human nature comes out while wrestling for a deal. Just remember that you are all in it together, equally gripped by what I like to call the thrift “fever.” Don’t forget to smile, move your cart out of the way and congratulate someone else on their great find (even if it makes you green with envy). 2. Get there early…or get there late. As with most big sales, the early bird gets the worm. However, there is something to be said for taking it easy, enjoying a leisurely brunch and arriving later in the day once the frenzy has died down. You can browse more thoroughly and calmly. And remember, not everybody is looking for the same things you are and they have probably left some great treasures behind. 3. Hit the road, Jack. The thrift store right down the road is easy pickings for everybody in your hood. If you’ve got the time, pack the cooler and hit the way out-of-the way spots on the edge of town and beyond. 4. Hydrate. Thrifting is a competitive sport after all and summer is in full swing. 1. Don’t bother with a cart. Make a couple trips out to the car if need be, but a cart is just going to slow you down…and every other shopper too. 2. Wear light layers (skirt + legging + t-shirt) for quick, easy, and perhaps public try-ons. Comfy shoes are a must. A hands-free purse is also a must. 3. Relax and have fun. The environment can get a bit tense and over-stimulating. Mentally prepare for the crowds, the unintentional bumps and shoves, the waiting, the dodging, the body heat. 4. Be polite. 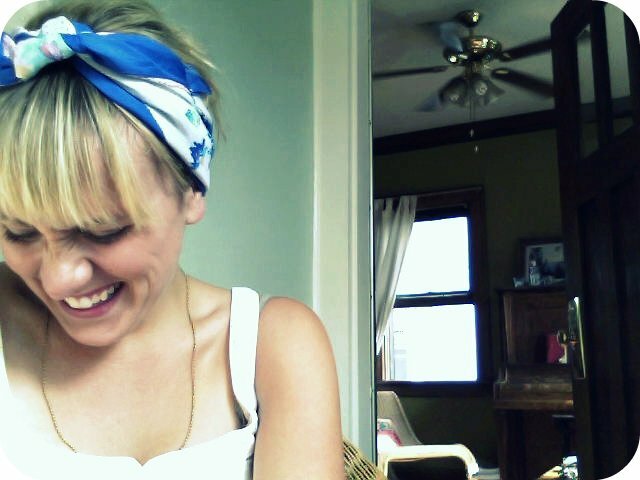 Smile at your fellow-thrifter. No need to be rude over saving a few bucks. 5. Watch your stuff! IF you do choose to take a cart, beware of those around you who might snag an item…or worse —your wallet! 1. Before I go, I think about the worst-case scenario—packed aisles, screaming children, pushy people, picked-over racks, no good finds. If I’m still psyched to thrift, I’ll go. If, after mulling it over and I’m not up for it, I don’t leave the house. I have gone to crazy sale days when I’m not feeling it and have never, ever, ever had a good time. 2. Unlike some of the gals above, I always grab a cart, because I know there’s a good chance I’m going to load it to the gills. There’s also been plenty of times I’ve almost had my arm fall off from trying to carry an insane amount of clothes without a cart. If you do choose to get a cart, mind that sucker! Don’t leave it in the middle of a crowded aisle to go find your friend, don’t block peoples’ way or hurry them along pushing the cart at their ankles—all of that sh*t is annoying. If you wind up in someone’s way (you will! ), smile and politely move. Respect your elders and moms with kids. 3. Pull everything that catches your eye and put in your cart. Even if you don’t plan on buying it, there’s no harm in pushing it around and thinking it over. Sale days are not the time to leave something on the rack you’re on the fence about, unless of course you feel like having your heart broken. Before you check out, go through everything you’ve pulled and sort through it (in an out-of-the-way corner). 4. After I’ve hit up my must-shop sections (vintage, dresses, purses, shoes, housewares, art work) and feel like I’m almost ready to go, I make a round of the entire store, paying attention to the racks near the mirrors and dressing rooms. I can’t tell you how many gems I’ve found in odd places due to people having second thoughts or finding stuff doesn’t fit. Also keep an eye out for staff restocking the racks. In sum, keep your eyes open all the time! 5. My final word of advice: Pushiness is a highly unattractive trait; one that’s exhibited far too frequently on sale days. As someone who literally thrifts for a living, take it from me: There’s not a dress, purse or paint-by-number on earth that’s worth acting undignified over. When you see someone who’s scored big, smile, compliment their finds and go home knowing that your day will come. A huge thank you to Rae, Lisa, Rose and Jill for sharing your hard-earned pearls of wisdom! I <3 you girls! 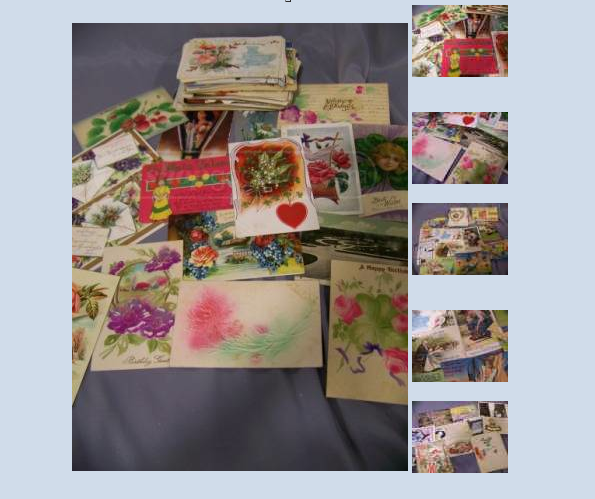 and this lot of vintage postcards. As if I don’t have enough. The majority of items on shopgoodwill.com are available for in-store pick up (with 24 hours advance notice), so if you get your heart set on, say, a piece of furniture or a heavy typewriter, you can swing by the Goodwill it’s from and pick it up after purchasing it online. If you’re not nearby, expect to pony up for shipping. I’ve been thinking about thrifting a lot lately. Thrifting in Tennessee to be exact. You see, in a just a few short weeks, my honey and I are leaving on an eight-day road trip. I’m so excited to hit up some small-town thrifts along the way, but I don’t want to spend hours upon hours researching store locations or combing through Craigslist, looking for estate sales in the area. And so, I’ve turned to my trusty iPhone. Over the past couple of weeks, I test drove a couple apps that you, my fellow thrift-a-holics, might find handy. 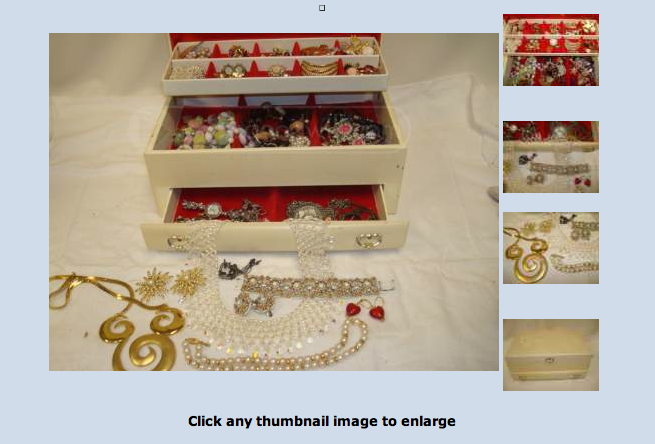 ♥ GSALR finds garage, yard and estate sales close to where you are. Uh, helpful much? 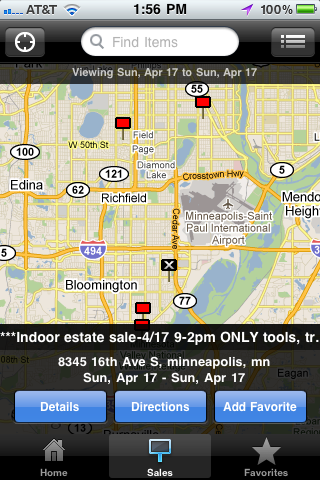 Here’s a screen shot taken this weekend, showing a handful of sales happening in South Minnie. When you click on the red squares, a teaser about each sale will pop up, including important info like the sale’s address and dates it’s happening. One tap from here will get you more details, directions or allow you to favorite the sale. This app is available here for 99 cents. ♥ Thrift Buddy taps into a list of 10,000 thrift and charity shops and it can also pull up sales listed on Craigslist, too. Talk about a one-two punch! Here’s a screen shot of the app’s map function. Hit one of these green pins and like magic, up pops info about that thrift. Hit it again, and you’ll be directed to more details including the shop’s address, hours, phone number and approximate distance from where you are. The main problem I’ve noticed with this app is that some of the listings are out-of-date. 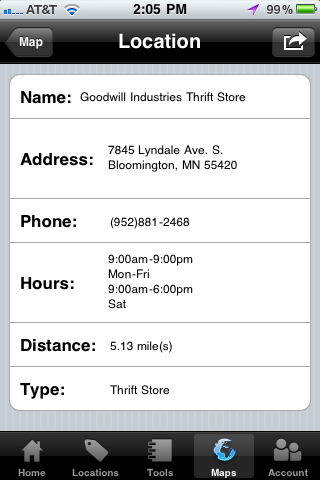 For example, the Bethesda Thrift Shop moved to Minnetonka more than a year ago, but the app still indicates that it’s located in downtown Hopkins. That said, I’m still pretty confident it’ll be a handy tool for our trip. If nothing else you can call the thrift and see if the address listed is correct, right? Thrift Buddy is a free app (a pro upgrade is available for $1.99) available here. Have you tried either of these apps? 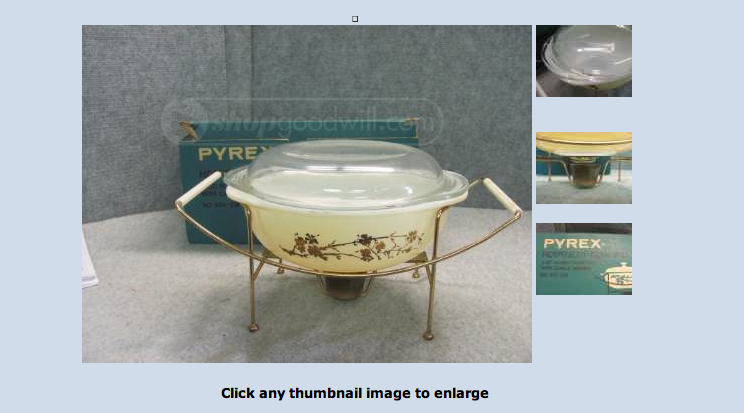 Are there other ones you find handy when you’re out and about thrifting or garage sale-ing? Fill me in! A few of you have tweeted or texted regarding what days each Unique/Valu Thrift Stores have their VIP savings days, so I thought I’d do a quick little post on the subject. 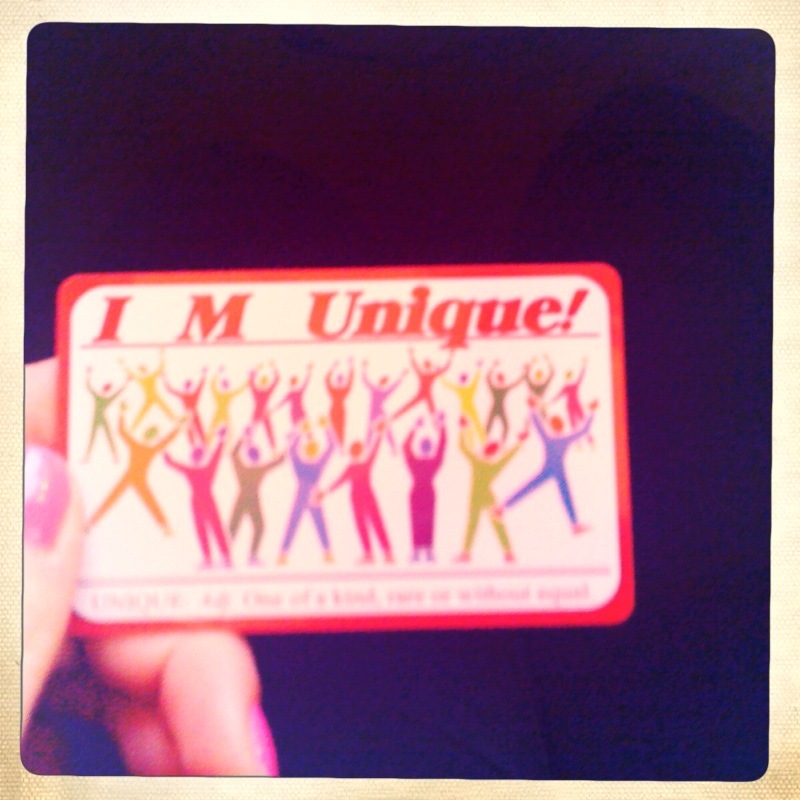 And if you don’t have an “I M Unique” savings card yet, here’s why you should!! ♥ It’s free to sign up! All you have to do is provide a little bit of basic info, including your email address. The entire process takes less than five minutes, and you can sign up at the front of any store. READ: You cannot sign up for the card the day of the a VIP-only sale, whether it’s a sale day or holiday. I’ve seen people try, and they are strict about this! ♥ Once you’ve signed up, you’ll save 25 percent off your purchases one day a week at all Unique and Valu Thrifts stores. ♥ You’ll also receive coupons and sale alerts via email. Sometimes the coupons are good for $10 off. 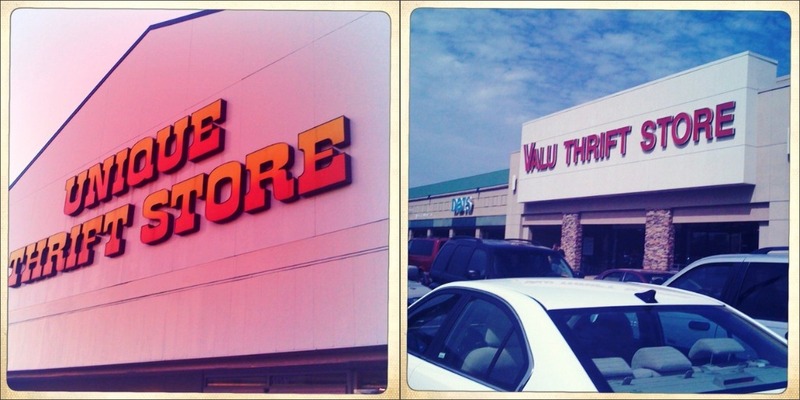 ♥ The Valu Thrift in Woodbury has it on THURSDAYS. I hope you all have had wonderful Thursdays so far. I’m counting down the hours until my post-work yoga session at my favorite studio in town…it’s been so long since I’ve worked out, I’m sort of nervous!